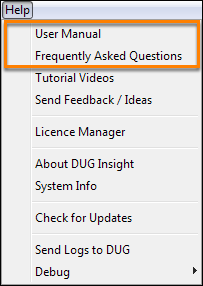 If you are new to Insight or having trouble with a particular feature, our online User Manual and FAQ provides a comprehensive guide to anything Insight-related. To understand the structure of the manual, and how to use it effectively, see How to Use this Manual. Click on User Manual. This will open the most current DUG Insight User Manual in your browser. In addition, click on Frequently Asked Questions for answers to some of the more common questions we have been asked. Tip: Alternatively, you can also access the user manual from Insight by opening the Start tab and clicking on the user manual link.